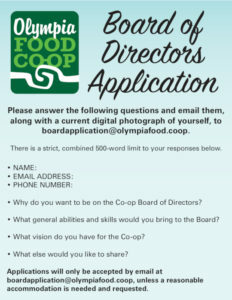 considering joining the board of directors? now is the time… applications due Sept 15! and the future of our community! 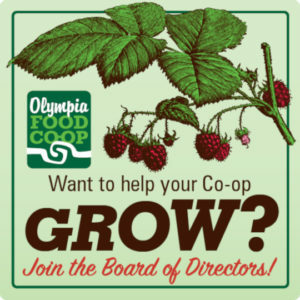 The Olympia Food Co-op Board of Directors is the elected body that represents the membership by establishing policies, overseeing the operating and capital budgets, approving plans and recommendations, and setting general guidelines for staff and working members. 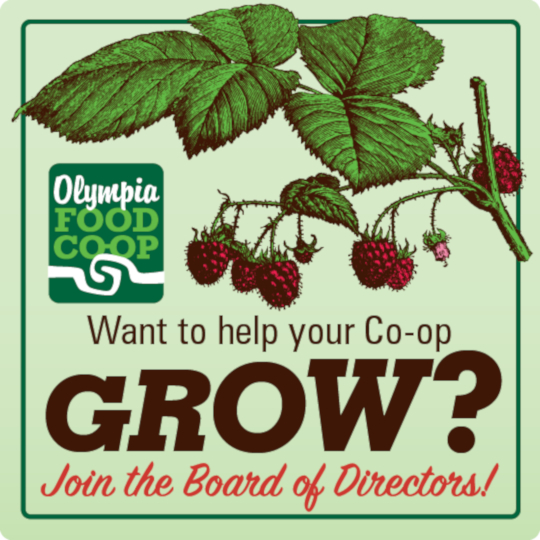 The Board holds ultimate legal responsibility for the operations and actions of the Co-op. The Board meets once a month on the third Thursday of the month from 6:30 – 9:30 p.m. Each Board member is required to join 2 – 3 committees which also meet 1 – 2 times per month (though this will vary from committee to committee). Board committees establish plans and policies that are then passed on to the Board or membership for approval. The standing committees include Finance, Expansion, Co-Sound, Ecological Planning, Standing Hiring, Local Products, and Member Relations. Board members volunteer 10+ hours each month. Click on these links for more information about the Committees of the Board, our mission statement, and our bylaws. 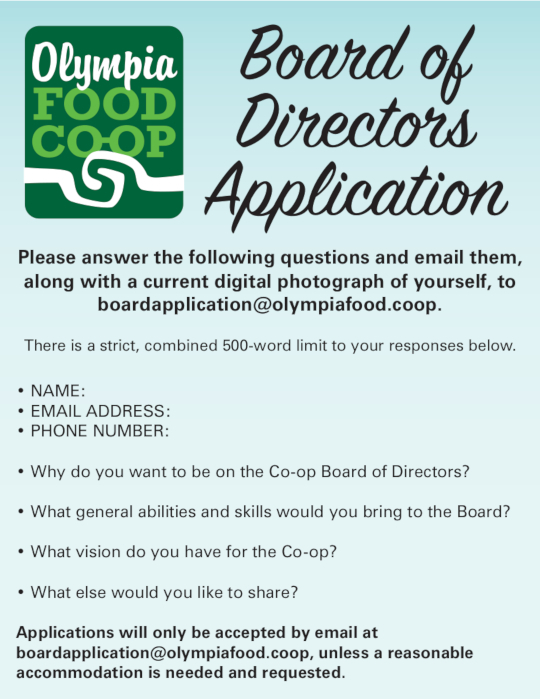 To be eligible to run for the Board you must be a member of the Co-op with a current address on file, and you must be willing to make a commitment through December 2021. Each Board Applicant is invited to the make a short speech to the membership at the 2018 Annual Meeting! Each year the memberships elects three new Board Members. Elected Board Members serve a three-year term! Please answer the following questions and email them here along with a current digital photograph of yourself. There is a strict, combined 500-word limit to your responses below. *Applications will only be accepted by email, unless a reasonable accommodation is needed and requested.